Composed by James Michael Stevens. Arranged by James Michael Stevens. Sacred, Jazz, Repertoire, Wedding, Secular. Sheet Music Single. 88 pages. Published by James M Stevens Music ASCAP (S0.7786). "Winter Serenade... Come Home" is a collection of 26 original piano compositions all composed in the first half of 2013. The music is very reflection, lyrical, and perfect for a quiet winter's evening. 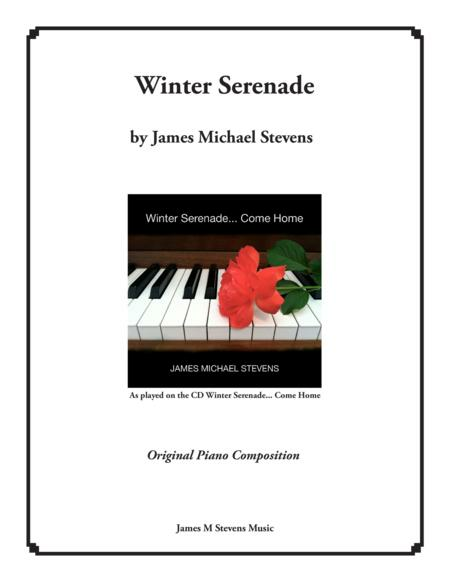 All the piano songs are written as played on the "Winter Serenade... Come Home" CD.The pieces are written at an late intermediate to early advanced level.James Michael Stevens is a prolific composer who resides in Nashville, TN where he is the Music Department Chairman at Welch College.Title List1. Winter Serenade2. Light a Single Candle3. Beautiful4. Quiet Stars, Quiet Thoughts5. Waiting for the Winter Snow6. Beautiful Today the Fallen Snow7. Lord, Hear My Humble Prayer8. Did You Ever Hear His Voice9. In the Sacred Night10. Blue and Jazz11. Softly Falls the Snow12. Sail Away in the Night and Dream13. Near to the Broken Heart14. Lay Your Burden Down15. Reflection on a Winter's Evening16. And the Winter Wind Blew Through the Trees17. Sleep, Sleep Little Child18. Midnight Starlight19. I Believe In You20. While He May Be Found21. Winter Meditation22. Soon the Springtime Flowers23. When I Close My Eyes I Think of You24. The Far Off Land25. The Road Home26. Come Home.